Microsoft started development on the .NET Framework in the late 1990s originally under the name of Next Generation Windows Services (NGWS). By late 2001 the first beta versions of .NET 1.0 were released. The first version of .NET Framework was released on 13 February 2002, bringing managed code to Windows NT 4.0, 98, 2000, ME and XP. Since the first version, Microsoft has released nine more upgrades for .NET Framework, seven of which have been released along with a new version of Visual Studio. Two of these upgrades, .NET Framework 2.0 and 4.0, have upgraded Common Language Runtime (CLR). New versions of .NET Framework replace older versions when the CLR version is the same. The .NET Framework family also includes two versions for mobile or Embedded device use. A reduced version of the framework, the .NET Compact Framework, is available on Windows CE platforms, including Windows Mobile devices such as smartphones. Additionally, the .NET Micro Framework is targeted at severely resource-constrained devices. On 19 July 2001, the tenth anniversary of the release of Visual Basic, .NET Framework 1.0 Beta 2 was released. .NET Framework 1.0 is supported on Windows 98, ME, NT 4.0, 2000, XP, and Server 2003. Applications utilizing .NET Framework 1.0 will also run on computers with .NET Framework 1.1 installed, which supports additional operating systems. The .NET Framework 1.0 Service Pack 1 was released on 18 March 2002. The .NET Framework 1.0 Service Pack 2 was released on 7 February 2005. The .NET Framework 1.0 Service Pack 3 was released on 30 August 2004. Version 1.1 is the first minor .NET Framework upgrade. It is available on its own as a redistributable package or in a software development kit, and was published on 3 April 2003. It is also part of the second release of Visual Studio .NET 2003. This is the first version of the .NET Framework to be included as part of the Windows operating system, shipping with Windows Server 2003. Mainstream support for .NET Framework 1.1 ended on 14 October 2008, and extended support ended on 8 October 2013. .NET Framework 1.1 is the last version to support Windows NT 4.0, and provides full backward compatibility to version 1.0, except in rare instances where an application will not run because it checks the version number of a library. .NET Framework 1.1 is supported on Windows 98, ME, NT 4.0, 2000, XP, Server 2003, Vista, and Server 2008. The .NET Framework 1.1 Service Pack 1 was released on 30 August 2004. A new hosting API for native applications wishing to host an instance of the .NET runtime: The new API gives a fine grain control on the behavior of the runtime with regards to multithreading, memory allocation and assembly loading. It was initially developed to efficiently host the runtime in Microsoft SQL Server, which implements its own scheduler and memory manager. .NET Framework 2.0 is supported on Windows 98, ME, 2000, XP, Server 2003, Vista, Server 2008, and Server 2008 R2. Applications utilizing .NET Framework 2.0 will also run on computers with .NET Framework 3.0 or 3.5 installed, which supports additional operating systems. The .NET Framework 2.0 Service Pack 1 was released on 19 November 2007. The .NET Framework 2.0 Service Pack 2 was released on 16 January 2009. It requires Windows 2000 with SP4 plus KB835732 or KB891861 update, Windows XP with SP2 plus Windows Installer 3.1. It is the last version to support Windows 2000 although there have been some unofficial workarounds to use a subset of the functionality from Version 3.5 in Windows 2000. 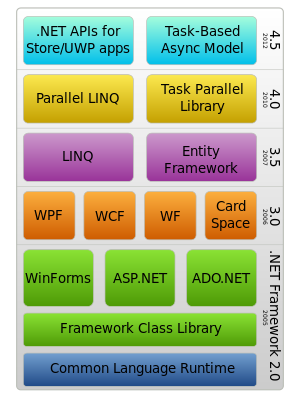 .NET Framework 3.0, formerly called WinFX, was released on 21 November 2006. It includes a new set of managed code APIs that are an integral part of Windows Vista and Windows Server 2008. It is also available for Windows XP SP2 and Windows Server 2003 as a download. There are no major architectural changes included with this release; .NET Framework 3.0 uses the same CLR as .NET Framework 2.0. Unlike the previous major .NET releases there was no .NET Compact Framework release made as a counterpart of this version. Version 3.0 of the .NET Framework shipped with Windows Vista. It also shipped with Windows Server 2008 as an optional component (disabled by default). .NET Framework 3.0 is supported on Windows XP, Server 2003, Vista, Server 2008, and Server 2008 R2. Applications utilizing .NET Framework 3.0 will also run on computers with .NET Framework 3.5 installed, which supports additional operating systems. The .NET Framework 3.0 Service Pack 1 was released on 19 November 2007. The .NET Framework 3.0 Service Pack 2 was released on 22 February 2010. Version 3.5 of the .NET Framework was released on 19 November 2007. As with .NET Framework 3.0, version 3.5 uses Common Language Runtime (CLR) 2.0, that is, the same version as .NET Framework version 2.0. In addition, .NET Framework 3.5 also installs .NET Framework 2.0 SP1 and 3.0 SP1 (with the later 3.5 SP1 instead installing 2.0 SP2 and 3.0 SP2), which adds some methods and properties to the BCL classes in version 2.0 which are required for version 3.5 features such as Language Integrated Query (LINQ). These changes do not affect applications written for version 2.0, however. .NET Framework 3.5 is supported on Windows XP, Server 2003, Vista, Server 2008, 7, Server 2008 R2, 8, Server 2012, 8.1, Server 2012 R2, 10, and Server 2016. The .NET Framework 3.5 Service Pack 1 was released on 11 August 2008. This release adds new functionality and provides performance improvements under certain conditions, especially with WPF where 20–45% improvements are expected. Two new data service components have been added, the ADO.NET Entity Framework and ADO.NET Data Services. Two new assemblies for web development, System.Web.Abstraction and System.Web.Routing, have been added; these are used in the ASP.NET MVC framework and, reportedly, will be used in the future release of ASP.NET Forms applications. Service Pack 1 is included with SQL Server 2008 and Visual Studio 2008 Service Pack 1. It also featured a new set of controls called "Visual Basic Power Packs" which brought back Visual Basic controls such as "Line" and "Shape". Version 3.5 SP1 of the .NET Framework shipped with Windows 7. It also shipped with Windows Server 2008 R2 as an optional component (disabled by default). Parallel Extensions to improve support for parallel computing, which target multi-core or distributed systems. To this end, technologies like PLINQ (Parallel LINQ), a parallel implementation of the LINQ engine, and Task Parallel Library, which exposes parallel constructs via method calls, are included. .NET Framework 4.0 is supported on Windows XP (with Service Pack 3), Windows Server 2003, Vista, Server 2008, 7 and Server 2008 R2. Applications utilizing .NET Framework 4.0 will also run on computers with .NET Framework 4.5 or 4.6 installed, which supports additional operating systems. .NET Framework 4.0 is the last version to support Windows XP and Windows Server 2003. .NET Framework 4.5 was released on 15 August 2012; a set of new or improved features were added into this version. The .NET Framework 4.5 is only supported on Windows Vista or later. The .NET Framework 4.5 uses Common Language Runtime 4.0, with some additional runtime features. .NET Framework 4.5 is supported on Windows Vista, Server 2008, 7, Server 2008 R2, 8, Server 2012, 8.1 and Server 2012 R2. Applications utilizing .NET Framework 4.5 will also run on computers with .NET Framework 4.6 installed, which supports additional operating systems. Native support for Zip compression (previous versions supported the compression algorithm, but not the archive format). New asynchronous features were added to the C# and Visual Basic languages. These features add a task-based model for performing asynchronous operations, implementing futures and promises. Integrated encoding routines from the Anti-XSS library (previously an external library) to protect from cross-site scripting attacks. The release of .NET Framework 4.5.2 was announced on 5 May 2014. This version requires Windows Vista SP2 and later. For Windows Forms applications, improvements were made for high DPI scenarios. For ASP.NET, higher reliability HTTP header inspection and modification methods are available as is a new way to schedule background asynchronous worker tasks. .NET Framework 4.6 was announced on 12 November 2014. It was released on 20 July 2015. It supports a new just-in-time compiler (JIT) for 64-bit systems called RyuJIT, which features higher performance and support for SSE2 and AVX2 instruction sets. WPF and Windows Forms both have received updates for high DPI scenarios. Support for TLS 1.1 and TLS 1.2 has been added to WCF. This version requires Windows Vista SP2 or later. The cryptographic API in .NET Framework 4.6 uses the latest version of Windows CNG cryptography API. As a result, NSA Suite B Cryptography is available to .NET Framework. Suite B consists of AES, the SHA-2 family of hashing algorithms, elliptic curve Diffie–Hellman, and elliptic curve DSA. .NET Framework 4.6 is supported on Windows Vista, Server 2008, 7, Server 2008 R2, 8, Server 2012, 8.1, Server 2012 R2, 10 and Server 2016. However, .NET Framework 4.6.1 and 4.6.2 drops support for Windows Vista and Server 2008, and .NET Framework 4.6.2 drops support for Windows 8. Added support in SQL Connectivity for AlwaysOn, Always Encrypted and improved connection open resiliency when connecting to Azure SQL Database. Azure SQL Database now supports distributed transactions using the updated System.Transactions APIs . On 5 April 2017, Microsoft announced that .NET Framework 4.7 was integrated into Windows 10 Creators Update, promising a standalone installer for other Windows versions. An update for Visual Studio 2017 was released on this date to add support for targeting .NET Framework 4.7. The promised standalone installer for Windows 7 and later was released on 2 May 2017, but it had prerequisites not included with the package. .NET Framework 4.7 is supported on Windows 7, Server 2008 R2, Server 2012, 8.1, Server 2012 R2, 10 and Server 2016. .NET Framework 4.7.1 was released on 17 October 2017. Amongst the fixes and new features, it corrects a d3dcompiler dependency issue. It also adds compatibility with the .NET Standard 2.0 out of the box. .NET Framework 4.7.2 was released on 30 April 2018. Amongst the changes are improvements to ASP.NET, BCL, CLR, ClickOnce, Networking, SQL, WCF, Windows Forms, Workflow and WPF. ^ "Framework Versions". Archived from the original on 4 May 2008. Retrieved 19 December 2010. ^ a b c d e f g h ".NET Framework Versions and Dependencies". MSDN. Microsoft. Retrieved 17 January 2014. ^ a b c Stebner, Aaron (14 March 2007). "Mailbag: What version of the .NET Framework is included in what version of the OS?". Aaron Stebner's WebLog. Microsoft. ^ "Install the .NET Framework on Windows 10 and Windows Server 2016". Microsoft. 20 December 2017. ^ a b c d e f g h i j k l m n o p "Lifecycle FAQ—.NET Framework". Microsoft. Retrieved 10 April 2018. ^ a b "What's New in Visual Studio .NET 2003". MSDN. Microsoft. Retrieved 1 September 2014. Visual Studio .NET 2002 shipped with the Microsoft .NET Framework SDK version 1.0. Visual Studio .NET 2003 ships with .NET Framework SDK version 1.1. ^ "What's New in Visual Studio 2005". MSDN. Microsoft. Retrieved 1 September 2014. ^ "What's New in Windows Server 2003 R2". TechNet. Microsoft. 22 August 2005. Retrieved 5 January 2015. ^ Chinnathambi, Kirupa (4 December 2006). "Expression Blend -- What Is That?". Expression Blend and Design. Microsoft. Retrieved 1 September 2014. ^ Guthrie, Scott (19 November 2007). "Visual Studio 2008 and .NET 3.5 Released". Scott Gu's Blog. Microsoft. Retrieved 1 September 2014. ^ "What's New in Visual Studio 2010". MSDN. Microsoft. Retrieved 1 September 2014. ^ "What's New in Visual Studio 2012". MSDN. Microsoft. Retrieved 1 September 2014. ^ "What's New in Visual Studio 2013". MSDN. Microsoft. Retrieved 1 September 2014. ^ Somasegar, S (29 June 2015). "Save the Date: Visual Studio 2015 RTM on July 20th". Somasegar's blog. Microsoft. ^ ".NET Framework 4.6.1 is now available!". .NET Blog. Microsoft. 30 November 2015. ^ Haffner, Stacey (3 August 2016). "Announcing .NET Framework 4.6.2". .NET Blog. Microsoft. ^ Haffner, Stacey (5 April 2017). "Announcing .NET Framework 4.7". .NET Blog. Microsoft. ^ Haffner, Stacey (17 October 2017). "Announcing .NET Framework 4.7.1". .NET Blog. Microsoft. ^ "Announcing .NET Framework 4.7.2". .NET Blog. Microsoft. 30 April 2018. ^ "Installing the .NET Framework 3.5 on Windows 8, Windows 8.1 and Windows 10". MSDN. Microsoft. Archived from the original on 27 April 2015. ^ "Gates Revises Visual Studio .NET Release Date". BetaNews. 2001-12-05. Retrieved 2016-07-01. ^ a b ".NET Framework System Requirements". MSDN. Microsoft. Retrieved 28 November 2016. ^ ".NET Framework Service Pack". Archived from the original on 21 May 2012. Retrieved 21 May 2012. ^ ".NET Framework Developer Center – Frequently Asked Questions". Archived from the original on 24 July 2012. ^ "New and Enhanced Features". MSDN. Microsoft. Archived from the original on 27 January 2011. ^ ".NET Framework 1.1 Redistributable". MSDN. Microsoft. ^ ".NET Framework 2.0 Software Development Kit (SDK) (x86)". Downloads. Microsoft. 29 November 2006. ^ "Microsoft .NET Framework 3.5 Administrator Deployment Guide". MSDN. Microsoft. Retrieved 26 June 2008. ^ "Microsoft .NET Framework 3.5 in Windows 2000". Archived from the original on 6 October 2011. Retrieved 6 October 2011. ^ ".NET Framework 3.0 Versioning and Deployment Q&A". Retrieved 1 June 2008. ^ "Windows Presentation Foundation". MSDN. Microsoft. Retrieved 1 September 2014. ^ "Catching RedBits differences in .NET 2.0 and .NET 2.0SP1". Archived from the original on 30 April 2008. Retrieved 1 June 2008. ^ Scott Guthrie (3 October 2007). "Releasing the Source Code for the NET Framework". Archived from the original on 7 September 2010. Retrieved 15 September 2010. ^ "Visual Studio 2008 Service Pack 1 and .NET Framework 3.5 Service Pack 1". Archived from the original on 8 July 2008. Retrieved 7 September 2008. ^ Justin Van Patten (21 May 2008). ".NET Framework Client Profile". BCL Team Blog. MSDN Blogs. Archived from the original on 7 December 2008. Retrieved 30 September 2008. ^ Rodriguez, Jaime (20 August 2008). "Client profile explained." Archived from the original on 5 February 2009. Retrieved 15 February 2009. ^ S. Somasegar. "The world of multi and many cores". Archived from the original on 22 June 2007. Retrieved 1 June 2008. ^ "Parallel LINQ: Running Queries On Multi-Core Processors". Retrieved 2 June 2008. ^ "Parallel Performance: Optimize Managed Code For Multi-Core Machines". Retrieved 2 June 2008. ^ "Code Contracts". Dev Labs. Archived from the original on 16 February 2011. ^ "BigInteger Structure". MSDN. Microsoft. Retrieved 11 March 2016. ^ "Complex Structure". MSDN. Microsoft. Retrieved 11 March 2016. ^ S. Somasegar. "Visual Studio 2010 and .NET FX 4 Beta 1 ships!". Archived from the original on 27 May 2009. Retrieved 25 May 2009. ^ "STM.NET on DevLabs". 27 July 2008. Archived from the original on 11 August 2009. Retrieved 6 August 2008. ^ a b S. Somasegar. "Announcing Visual Studio 2010 and .NET FX 4 Beta 2". MSDN Blogs. Archived from the original on 22 October 2009. Retrieved 20 October 2009. ^ Caron, Rob. "Visual Studio 2010 and .NET Framework 4 Launch Date". MSDN Blogs. Archived from the original on 17 January 2010. Retrieved 13 January 2010. ^ Protalinski, Emil (12 April 2010). "Visual Studio 2010 and .NET Framework 4 arrive". Ars Technica. Condé Nast. ^ "Update 4.0.1 for Microsoft .NET Framework 4 - Design-Time Update for Visual Studio 2010 SP1". Support.microsoft.com. 2012-06-25. Retrieved 2013-01-16. ^ "Microsoft .NET Framework 4 Platform Update 1 - The .NET Endpoint - Site Home - MSDN Blogs". Blogs.msdn.com. 2011-04-19. Retrieved 2013-01-16. ^ "Update 4.0.2 for Microsoft .NET Framework 4 – Runtime Update". Support.microsoft.com. 2012-06-14. Retrieved 2013-01-16. ^ "Update 4.0.3 for Microsoft .NET Framework 4 – Runtime Update". Support.microsoft.com. 2012-08-03. ^ "AppFabric Blog - Windows Server AppFabric now Generally Available". blogs.iis.net. ^ "'Dublin' App Server coming to .NET 4". DevSource. Archived from the original on 26 December 2017. Retrieved 27 April 2009. ^ ".NET Framework 4 and Dublin Application Server". MSDN Blogs. Archived from the original on 10 May 2009. Retrieved 27 April 2009. ^ Brandon Bray(MSDN Blogs). "Announcing the release of .NET Framework 4.5 RTM - Product and Source Code". Retrieved 15 August 2012. ^ MSDN Library. "What's New in the .NET Framework 4.5". Retrieved 15 August 2012. ^ ".NET Framework 4.5". Microsoft Download Center. ^ "Standalone Installers .NET 4.5". microsoft.com. Archived from the original on 17 August 2012. Retrieved 16 December 2018. ^ rpetrusha. ".NET Framework Versions and Dependencies". msdn.microsoft.com. ^ ".NET for Windows apps". MSDN. Microsoft. Retrieved 26 January 2016. ^ "Async in 4.5: Worth the Await - .NET Blog - Site Home - MSDN Blogs". Blogs.msdn.com. Retrieved 2014-05-13. ^ "Asynchronous Programming with Async and Await (C# and Visual Basic)". Msdn.microsoft.com. Retrieved 2014-05-13. ^ "Managed Extensibility Framework (MEF)". MSDN Blogs. Microsoft. Retrieved 4 October 2016. ^ ".NET Framework 4.5.1 RTM => start coding". .NET Framework Blog. Microsoft. 17 October 2013. Retrieved 18 November 2013. ^ "Microsoft .NET Framework 4.5.1 (Offline Installer)". Download Center. Microsoft. 12 October 2013. Retrieved 18 November 2013. ^ ".NET Framework 4.5.1 RTM => start coding". MSDN Blogs. Microsoft. Retrieved 4 October 2016. ^ a b "Announcing the .NET Framework 4.5.2". MSDN Blogs. Microsoft. Retrieved 11 June 2014. ^ "Microsoft .NET Framework 4.5.2 (Offline Installer)". Download Center. Microsoft. 6 May 2014. Retrieved 6 May 2017. ^ .NET Team. "Announcing .NET 2015 Preview: A New Era for .NET". Retrieved 27 February 2015. ^ a b c Lander, Rich (20 July 2015). "Announcing .NET Framework 4.6". .NET Blog. Microsoft. The team is updating the System.Security.Cryptography APIs to support the Windows CNG cryptography APIs [...] since it supports modern cryptography algorithms [Suite B Support], which are important for certain categories of apps. ^ a b c ".NET Framework System Requirements". MSDN. Microsoft. Retrieved 18 August 2016. ^ "CNG Features § Suite B Support". Cryptography API: Next Generation. Microsoft. Retrieved 1 January 2016. ^ ".NET Framework 4.6.1 is now available!". MSDN Blogs. Microsoft. Retrieved 19 February 2016. ^ "Announcing the .NET Framework 4.6.2 Preview". .NET Blog. Microsoft. ^ "Announcing .NET Framework 4.6.2". .NET Blog. Microsoft. ^ Lander, Rich (5 April 2017). "Announcing the .NET Framework 4.7". .NET Blog. Microsoft. ^ "Microsoft .NET Framework 4.7 (Offline Installer)". Download Center. Microsoft. 2 May 2017. ^ "The .NET Framework 4.7 installation is blocked on Windows 7, Windows Server 2008 R2 and Windows Server 2012 because of a missing d3dcompiler update". Support. Microsoft. 3 May 2017. ^ "What's New in the .NET Framework". docs.microsoft.com. Microsoft. Retrieved 28 April 2017. ^ Krishna, Preeti (17 October 2017). "Announcing the .NET Framework 4.7.1". .NET Blog. Microsoft. ^ "Announcing the .NET Framework 4.7.1". microsoft.com. ^ "Announcing the .NET Framework 4.7.2". Retrieved 2018-06-12. ^ "What's new in the .NET Framework". microsoft.com.